Plastic surgery is a surgical specialty that deals in the alteration, reconstruction or repairing parts of the body by the transfer of tissue. It also has a branch that is concerned with improving the ability and function of different parts of the body. Below are the 5 most popular plastic surgeons in Karachi based on internet search by users in Karachi. She is one of the best and highly experienced doctor in the field of plastic surgery. She is an MBBS and FCPS qualified Plastic surgeon and is also a renowned expert in reconstructive, plastic, cosmetic and scalp surgery with 13 years of experience. She currently practices in Zubaida Medical Centre and Institute of Plastic Surgery, Karachi. He is another renowned name among plastic surgeons who is FCPS qualified. With 11 years of experience, he is an expert of his field of surgery. He practices at National Medical Centre, Dr Ziauddin Hospital Clifton, Karachi Slimming & Aesthetic at Sabs the Saloon. He technically combines the art of surgery with his real artistic sense and has introduced many new procedures of cosmetic surgery. He is a highly qualified dermatologist and cosmetic surgeon. He has been working for 14 years providing services such as skin whitening, Laser hair removal, Platelet Rich Plasma, Acne Scar Correction and Mesotherapy. He has the following degrees; MBBS, MD (USA), D Derm (London), DRCP Derm (London), MSc. Dermatology (London), and many other diplomas from USA proving his medical excellence in his respective field. He practices at The Skin where he provides high class Dermatological care, DHA Medical Centre, Medicare Cardiac and General Hospital and Central Hospital, Karachi. He is a hair transplant surgeon who is MBBS and FRCS qualified. He has 38 years of experience and is highly trained and an expert plastic surgeon. His aesthetic sense along with his consistent quality work and supportive staff makes him one of the best in his field. He currently practices in Zubaida Medical Centre, Karachi. 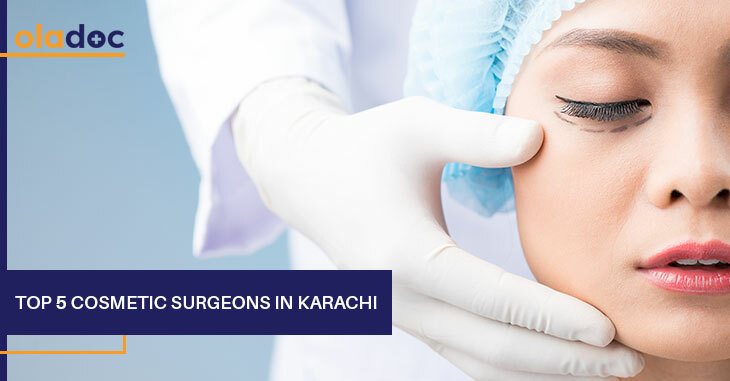 Dr. Tahir Sheikh is a Plastic Surgeon practicing in Karachi and has 30 years of experience. He is an MBBS and FCPS doctor and is considered a highly trained hair transplant surgeon. His extensive professional experience, staunch commitment, honesty and integrity are some of his best traits, He currently practices in The Doctor’s Plaza, and OMI hospital Karachi. Choosing the right cosmetic surgeon will be a choice you will have to live for many years in your life. A successful operation can make you feel like yourself and give you a great confidence boost for the rest of your life. So, you must choose wisely. You can find and book an appointment with other top Plastic Surgeons in Lahore, Karachi, and Islamabad through oladoc.com. You can also call our helpline at 042 3890 0939 for assistance to find the RIGHT Doctor for your health concerns. « The Effects Of Self-Treatment: A Way To Harm Or A Chance To Heal?